David Clarke scored 129 not out. There were mixed emotions for Peterborough Town skipper David Clarke on Saturday. 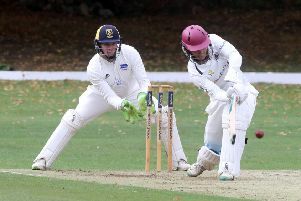 He was elated after making his best Northants League Premier Division score of 129 not out in a win over Northampton Saints but at the same time saddened to see that table-topping Old Northamptnians had won again. The ONs victory at Rushden means they remain 44 points clear of Town with four games to go and they’re racing certainties to take the title. Town, who were bidding for their fourth title in five years this season, are in third place, eight points behind Finedon. And certainly on the evidence of the form they’ve shown in their last two games, Town are well capable of taking runners-up spot, especially as they still have Finedon to play. Against Saints on Saturday, Clarke led from the front with the second highest score of his career - his best is 140 for Cambs in 2010. His 129 not out coupled with 77 not out from Kieran Judd and 59 from Alex Mitchell enabled Town to declare at 289-2 after 48 overs. In reply Saints struggled at the start and were 40-3. But an almighty wallop from Dan Harris - 141 off 96 balls - put them back in contention. Once he went though, clean bowled by Joe Dawborn, it was effectively game over and their innings ended 37 runs short at 252. Dawborn finished with 6-53. This Saturday, Town are at home to Rushton and revenge is on Clarke’s mind. He said: “They are a pretty strong side and beat us in the 20/20 so we need to avenge that one.